ESCAPE & BLOW SYSTEMS AND MECHANISMS **** POLYCAST AND CUSTOM TOOLED STAINLESS STEEL AUTOMATIC VIBRATORY PARTS FEEDER BOWLS AND PART HANDLING SYSTEMS FOR FEEDING FASTENERS TO AUTOMATIC SCREWDRIVERS AND NUT RUNNERS. From concepts for screw feeders to design to completed systems, MCI will provide you with a system of the highest quality within your required timeframe and well within your budgetary guidelines for screw feeders. With our design capabilities for screw feeders, manufacturing expertise, and stringent quality control standards you can rest assured that there is no need to look elsewhere for bits and pieces of a system. With MCI your needs are covered; no need to buy a screwdriver here, a nut runner over there, controls from yet another supplier, and the automation to make it all work from yet another. We're not just integrators, we're creating the system from the ground up, and you can start with our screw feeders. We would be pleased to submit a quotation on a complete Lean Manufacturing Cell or automatic screwdriver package that meets your automatic screwdriving requirements. Please contact one of our consultants by E-mail, or call us at 317-776-1970. MCI/Screwdriver Escape and Blow Mechanisms are custom-designed modular components that will accurately meter fasteners one at a time for positive positioning in automatic screwdriver receiver heads, nut drivers or insertion stations. Depending upon production requirements fasteners may be fed from centrifugal parts feeders, linear parts feeders, stepper feeders, or vibratory bowl feeders, to our custom designed escape and blow mechanism and metered one at at time to your automated assembly operation. MCI/Screwdriver standard escape and blow mechanisms escapements and isolators are adaptable to your part size and tooling requirements. Mechanisms for isolation and positioning your fasteners may also be offered as an option. 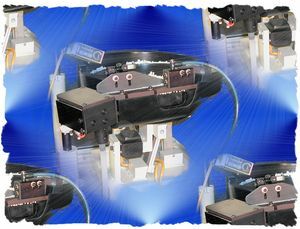 MCI/Screwdriver isolator mechanisms may be integrated with centrifugal parts feeders, linear parts feeders, stepper feeders, or vibratory polycast or stainless steel bowl feeders, providing for a dependable, low cost solution which mechanically escapes parts one at a time to a work station or placement mechanism. 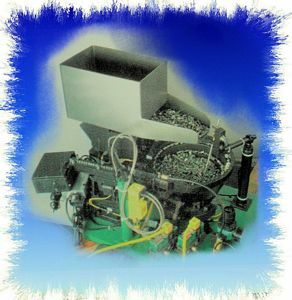 Mechanisms desgned for the purpose of escapement of your parts tracked from MCI/Screwdriver centrifugal parts feeders, linear parts feeders, stepper feeders, or vibratory Polycast or stainless steel feeder bowls, (or bowl feeders), use standard componentry where possible to meet your specific needs. Other examples of customized devices include multitrack escapements, escape and blow devices and single-station assembly mechanisms. Our MCI/Screwdriver product line includes a complete line of eacapement mechanisms, including placement and assembly devices designed to accept parts tracked from centrifugal parts feeder bowls, linear parts feeders, stepper feeders, vibratory bowl feeders, and Polycast feeder bowls. (Shown at the right is a standard tooled screw escapement mechanism custom tooled to accept headed parts from a Polycast feeder bowl and vibratory straighl line combination). This concept is most generally used to escape and blow screws to MCI/Screwdrivers Automatic Screwdrivers.